Wilshere, 25, has been on loan with the Cherries most of the season from Arsenal but has missed the end of the campaign with a fractured leg. "I think it's going to be really difficult for us," said Howe, when asked on Friday about the chances of re-signing Wilshere. 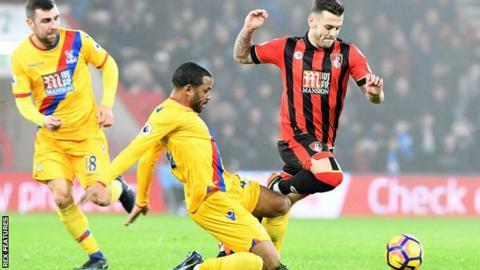 After signing at the end of August, England international Wilshere made 27 league appearances for the Cherries - including five as a substitute - without scoring, although he managed two assists. Scans revealed a hairline crack in Wilshere's left fibula after he was injured during a 4-0 defeat at Tottenham on 15 April. "When we signed him on loan, and I have said this many times, the plan was for him to stay for a season and then to go back to Arsenal to evaluate his future," added Howe, whose side have secured a third straight season in the Premier League. Bournemouth are 11th in the Premier League table, eight points above the relegation zone, with two games remaining at home to Burnley (15:00 BST) on Saturday and away to Leicester on 21 May (15:00 BST).